Temporary Anchorage Devices (TADs), a.k.a. microimplants/mini-implants, are essentially small, screw-like dental implants made of a titanium alloy. As their name implies, these are temporary and are removed once the desired tooth movement has been completed. Their function is to provide a stable anchorage — that is, a fixed point around which other things (namely, teeth) can be moved. 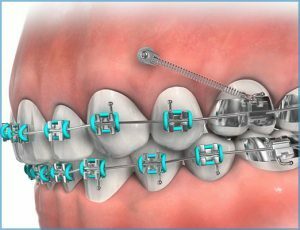 The use of TADS offers many benefits: It may shorten overall treatment time, eliminate the need to wear elastics (rubber bands) — and in some cases, even make certain oral surgeries unnecessary. It also allows orthodontists to take on complex cases, which might formerly have proved very difficult to treat. This small device can really do a big job! Schedule your free complimentary consultation visit with Dr. Abbasi to see if your orthodontic treatment might benefit from the use of a TAD.